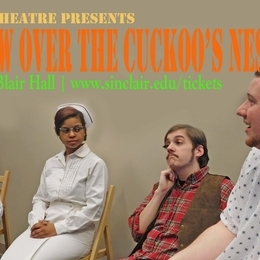 Sinclair Theatre will present One Flew Over The Cuckoo’s Nest, by Dale Wasserman, based on the novel by Ken Kesey, from April 8-16th, in Blair Hall in building 2 on the downtown Dayton campus. Directed by Nelson Sheeley, the story focuses on a charming rogue, Randle P. McMurphy, who chooses to serve a short sentence in a mental institution rather than one in a prison. Quickly, he takes over the ward and accomplishes what the medical profession has been unable to do; helping fellow patients improve their condition through unorthodox antics. He clashes with the head nurse Ratched, who resents his successes and retaliates by abusing her authority. The 1975 Academy Award winning film, starring Jack Nicholson, was based on the novel so offers vastly different dialogue than the stage play. It is also more of an ensemble piece, rather than a star vehicle for Nicholson. Reserved seating is available at $18 for adults/$15 for students and seniors with exception of Throwback Thursdays when ALL seats cost $10. Tickets may be purchased online anytime at www.sinclair.edu/tickets or at the box office, one hour prior to performances (if tickets are still available). Performance times are at 8 p.m. on Fridays and Saturdays, at 2 p.m. on Sunday, April 10th and at 7 p.m. on Thurs., Apr. 14th. Thursday and Sunday performances are American Sign Language interpreted by Frank Gayhart, Andrew Burris and Jordan Israel-Kendrick. There will also be a midweek morning matinee at 10 a.m. on Wed., April 13th for high school and home school groups at a reduced rate. For group information contact: patti.celek@sinclair.edu. Sinclair students with a valid Tartan ID may take advantage of this Wednesday matinee discount via a student rush: purchase a "rush" ticket for $5 with ID AT THE BOX OFFICE between 9-9:50 a.m. on Wed., April 13th ONLY.